Strap in and feel the road whiz by as you drive the Air Hogs FPV High Speed Race Car. As the first–of-its-kind race car featuring FPV (First Person View), this vehicle puts you right in the driver’s seat. Experience the race from behind the wheel as the view from the dashboard is streamed directly into your headset. Outfitted with unique LED light features and strong treads, this RC vehicle is able to tackle both indoor and outdoor roads. At 10” x 6” x 3”, this agile radio-controlled car is raring to hit the track. Hitting scale speeds of 160 mph, you can use it to race against your friends! Shift gears and feel the adrenaline with Air Hogs FPV High Speed Race Car. Air Hogs FPV High Speed Race Car puts you behind the wheel: see what your car sees, streamed straight from the dashboard camera into your headset. 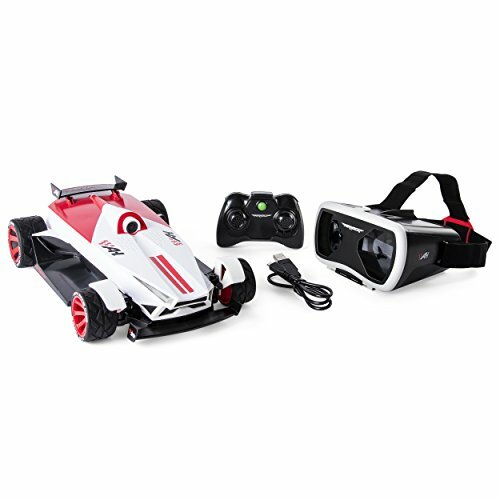 Race past your competitors at speeds of up to 160 mph with this easy-to-use remote control car. Communication range of 250 ft., frequency range of 2.4 GHz. Charge for 40 minutes, play for 10 minutes. Record, edit, and share your epic racing videos through the Air Hogs FPV app. Made for kids aged 8+. Charges via USB. 4-Channel controller requires 2 x AAA batteries (not included). For indoor or outdoor use. Free app available for iOS and Android. Tagged High, Hogs, Race, Speed. Bookmark the permalink.